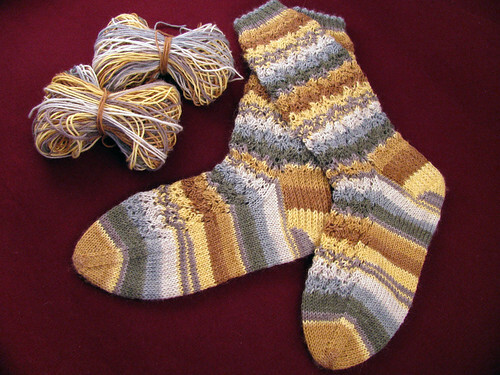 I finished the ‘glynis’ socks. I now realize that the pattern is really great and any problems I had with it were due to my ineptitude. How do I know this? I know this because it took me at least 50 tries to graft the toes with the kitchener stitch. I had some trouble starting. I had even more trouble just keeping the knit and purl movements straight. Time after time I would be done with a toe and there would be a purl stitch. I even asked my son to write some kind of song to sing so I would do the right movement in the right order. He said he was a performer and not a composer. I am trying out all my old sorority songs and seeing if I can come up with something. “Boom Boom, Knit off the front stitch, then purl, Boom Boom, Purl off the back stitch, now knit… etc.” I still have to figure out the etc. part. There was quite a bit of yarn left over from a 100 gram skein. Now I will be confident about not running out of yarn on my next pair. Even though I bitched and complained though this project, it was a great learning experience. I like the socks too. This entry was posted on Thursday, April 30th, 2009 at 3:00 am and is filed under Knitting. Tagged: Knitting. You can feed this entry. You can leave a response, or trackback from your own site. They came out great! The stripes match perfectly!